Extra-powerful automatic mist cannon with a spraying range of 150 m. The SprayCannon produces a fine mist and cleanses the air of the finest dust particles. The integrated fog machine is made of stainless steel. 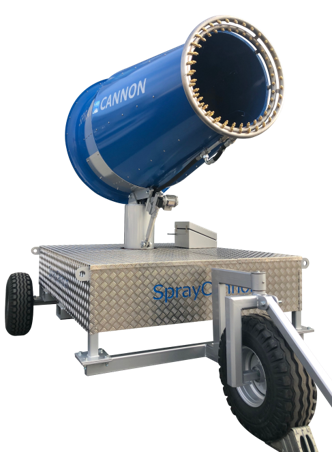 The SprayCannon suppresses dust in an environmentally friendly and efficient way at crushing sites, demolition sites, mining, when handling raw materials or cross-docking bulk goods. DEMOLITION - CONCRETE PRODUCTION PLANTS - RECYCLING SITES & PLANTS - ENVIRONMENTAL SITES; SOIL REMEDIATION - STEEL/SLAG HANDLING SITES & PLANTS - WOOD/ALUMINUM PROCESSING PLANTS - FIREFIGHTING - THE SPRAYCANNONS ARE ALSO USED FOR COOLING DOWN BULK MATERIALS, MACHINES AND PERSONS.